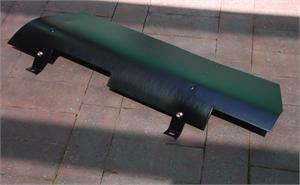 This item is that hard to find blower cover located in the trunk of your Classic 911/930 Porsche. It also fits 930 models from 1975 on, that have a power brake booster as well as any 74+ 911/912e that has been refitted with a power brake booster. These models use snaps at the top for attachement of your trunk carpet set. If your Porsche has trunk set that uses leather staps to attach please browse our offerings to find the correct cover.